P1264. ANNIE FISCHER, w.Blomstock Cond. : Concerto #4 in G (Beethoven), Broadcast Performance, 1973; w.Moralt Cond. 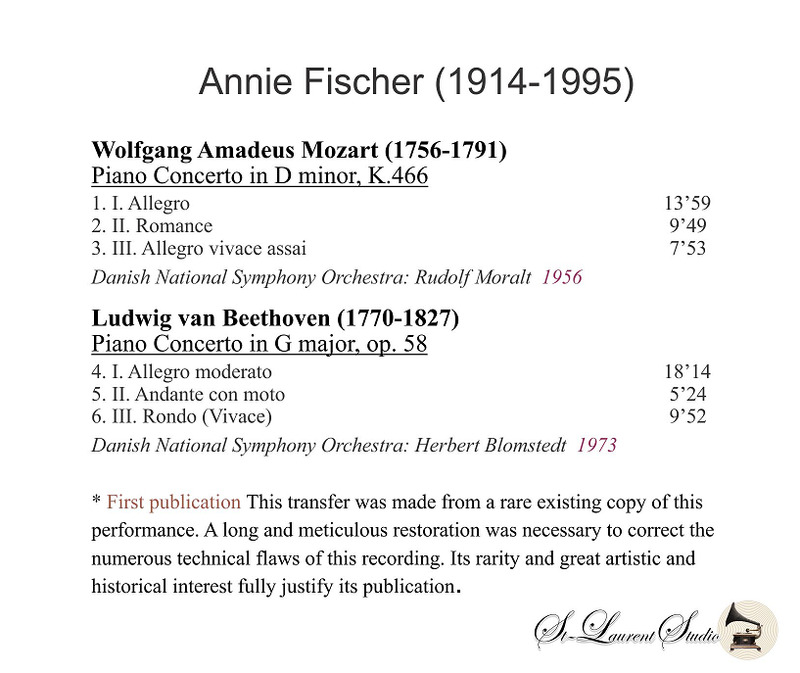 : Concerto #20 in d, K.466 (Mozart), Broadcast Performance, 1956, (Danish National S.O., in both). (Canada) St Laurent Studio YSL T-455. Transfers by Yves St Laurent. 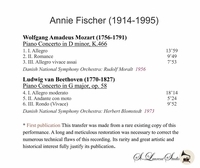 “Annie Fischer, a Hungarian pianist known for the elegance of her Mozart performances and her vital, prismatic approach to early Romantic repertory, was a pianist who played with an intensity of concentration and focus that seemed almost at odds with the poetry and impetuousness of her interpretive style. She shunned the machinery of modern career-making and rarely gave interviews. Preferring not to be far from Budapest, she performed mostly in Europe, although she undertook several brief tours of the United States over the last 13 years. 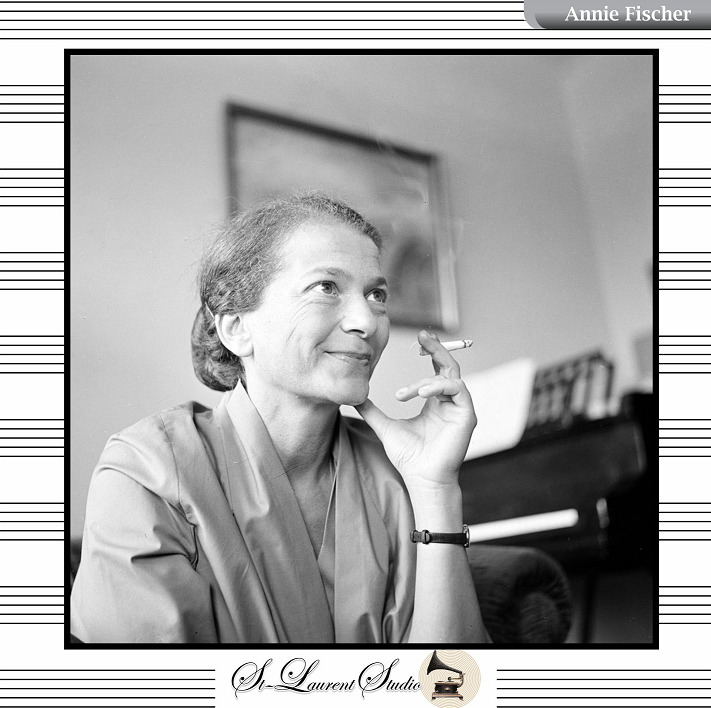 And because she disliked making recordings, the comparatively few disks she recorded for Deutsche Grammophon and EMI are prized by collectors. Miss Fischer was born in Budapest on July 5, 1914, and studied with Anton Székely and Ernst von Dohnanyi at the Franz Liszt Academy. She made her public performing debut in Budapest when she was 8, and she toured as a concerto soloist when she was 12. Her mature career began in 1933 when she toured Europe as the winner of the first prize in the Franz Liszt International Piano Competition. In 1935 she married the musicologist and conductor Aladar Toth, who died in 1971. In 1941 they left Hungary for Sweden, and Miss Fischer suspended her performing career during World War II. She began touring Europe again in 1946, after she and her husband returned to Budapest. But she did not make her United States debut until 1961, when she played the Mozart Concerto in E flat (K. 482) with George Szell and the Cleveland Orchestra at Carnegie Hall. Her American performances thereafter were sporadic, and she made her belated Carnegie Hall recital debut in 1982. In recent seasons, she gave recitals every two or three years at the Metropolitan Museum of Art.